Alright, let’s get the ten ton gorilla out of the room. 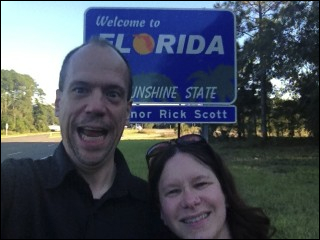 I know that I promised you all a symbiotic “ride along,” so-to-speak, on our recent honeymoon by blogging along the way. I had every intention of blogging every day. Then I decided that would take up too much time and thought that I would post just twice, covering the first three days and the last three days. But then, my wife put on this really cute red bikini and invited me to the beach. So here I am in paradise with my absolutely beautiful bride who really, really knows how to wear a cute red bikini and, well, suffice it to say that I decided not to blog. If the invitation to the beach wasn’t enough to dissuade me (and, gosh…it was), we had perfect weather (both in and out of the water), inviting ocean breezes, white sandy beaches, great restaurants, tourist traps all around us and really cool Civil War sites to explore. So tell me: what would you have done? Uh huh. That’s what I thought. I did achieve my two technology related goals, however: First, I proved to myself that I actually can blog successfully–albeit a bit difficultly–on an iPad while traveling. While keying copious amounts of text on a virtual keyboard isn’t the easiest thing to do, it does work if I decide not to lug my MacBook along. And secondly, that in general, an iPad can indeed take the place of a laptop in some situations. I was all worried and twitchy about only bringing my iPad, but it worked flawlessly for everything I needed it to do and it weighs so much less in a suitcase. Anyhow, now that we’ve established that my lack of blogging on the honeymoon was actually my wife’s fault (and God bless you, baby), buckle up and we’ll go for a ride. As a few of you now know, we split our honeymoon in two parts. One half was spent on wonderful Amelia Island, Florida while the second half was spent further west along the panhandle in Destin. I kept these plans a closely guarded secret from everyone including my wife. I wanted to surprise her with a honeymoon that she would never forget and I reasoned that if I told anybody else what my plans were, it could very easily get back to her. So I went with the cover story that we were only going to Destin. My strategy worked. 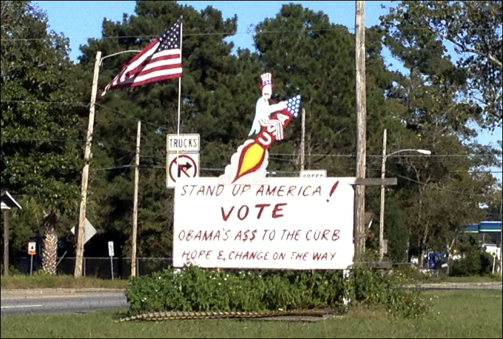 My wife had no idea about Amelia Island until driving into town where she happened to see a street sign. “Split it in two? But why? !” I heard somebody incredulously ask. I’ll be happy to tell you. Planning a honeymoon isn’t easy. Especially when you have to deal with my particular hangups. It’s a once in a lifetime thing and I wanted it to really feel like once in a lifetime. So we talked and we pondered and we talked some more and then we argued (really, it was more like really loud talking) and just when we thought we had it figured out, we threw out those plans, spoke loudly again and pondered some more. The whole problem stemmed from my fear of airplanes. I hate them. I am quite convinced that airplanes run on magic and are flown by wizards. We knew that we wanted to go someplace tropical, but we also knew that we needed to rely on something other than magic to get there. It’s not so much the flying that I hate, it’s the coming down in an unexpected manner at an unplanned time that gives me pause. And so after I explained my theory of magic to my–at the time–fiancé and she finished rolling her eyes at me (something else I think may be accomplished using magic), she begrudgingly agreed that we would stay within the continental United States and drive to our honeymoon destination. Originally we talked about going to a Sandals resort, but this obviously requires air travel, so Sandals was off the table at this point. The only other obvious option was Florida. Since it is indeed tropical and much of it is reachable by automobile (no magic required), it seemed to be the most likely candidate. But where oh where in Florida to go? We looked at the Keys, but alas, they are simply too far away by car unless you can arrange a two-week honeymoon, something I could not do nor afford even if I could have arranged it. We asked friends on Facebook for recommendations. Many of the suggested destinations seemed like nice places for a family vacation, but they lacked that over-the-top, unforgettably romantic honeymoon feeling that I was striving to achieve. We consulted a travel agent who, God love her, was of no help whatsoever. She had a layer of dust on her at least an inch thick and I’m pretty certain that the phone she was using may have been an original prop from that 1980 hit Nine to Five, starring Nashville’s own Dolly Parton. I wanted to find someplace that gave that Sandals feeling: a place which was both wildly beautiful and dreamily romantic, peaceful and restful, but was also fun with a party atmosphere and great nightlife when we wanted that sort of thing. Most importantly we wanted an adult honeymoon. And by that, I mean we didn’t want a bunch of uncontrolled, screaming children running around causing havoc, something that Sandals would give us since they are adult-only resorts. Getting all of this out of Florida was a tall order. Near impossible as I learned. I knew that Destin would give us the party, but by no means would it provide the romance. Destin is more of a “spring break” atmosphere mixed with a whole bunch of people taking family vacations. Not exactly romantic. And so in the end, the only logical thing to do was to split the honeymoon into two parts so that we could get the best of both worlds: wild romanticism and total peace on one side and a party every night on the other end. Finding the romantic side was the hard part. And then suddenly one evening after searching for literally weeks, I found it! 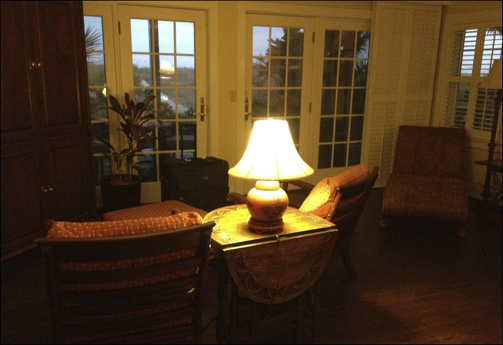 The Elizabeth Pointe Lodge is a small country inn on Amelia Island (on the eastern side of the panhandle). It sits just a few hundred feet from the Atlantic ocean, it has romanticism written all over it and it’s not the kind of place that parents bring children. So, it was decided. Amelia Island and Destin were our destinations and taken together, they would provide the closest thing to a Sandals feeling as you can get without actually going to Sandals. 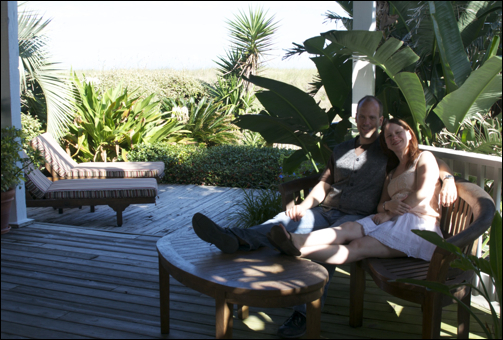 This is the story of the first three days of our honeymoon on Amelia Island. Getting There is Half the…Pain! If you’ve ever seen National Lampoon’s Vacation (only the world’s greatest movie about the family vacation), then you recognize the truth that taking a road trip can be the best of times and the worst of times. Our honeymoon road trip was no exception to that age-old, tried and true rule. 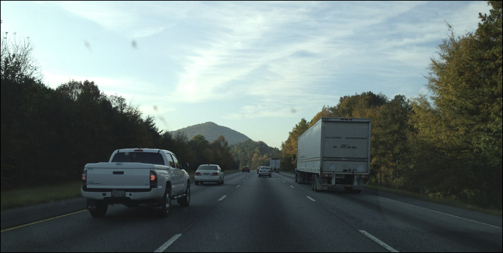 We began our journey to Amelia Island and Destin, Florida on October 22nd, 2012 at 4:00 AM and by the time we arrived back home a week later, we would drive through gangland Georgia, past at least four different prisons, and through rural Alabama, which is unlike any place I have ever seen. Here’s a map of our journey from Franklin, Tennessee to Amelia Island, Florida. According to Google and Magellan’s RoadMate iPhone app, It should take ten hours. Google and Magellan are wrong. It’s 4:00 AM on October 22nd and we’re ready to get on the road! Along the road, somewhere in Tennessee. Only twelve more hours to go! 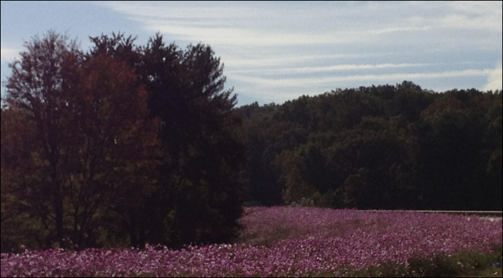 Georgia has a propensity toward decorating all of their highway exits with these curious purple flowers. It was quite a pretty sight. Using the trusty Magellan RoadMate app on your iPhone, you too can see gems like this in Waycross, Georgia on your way to Amelia Island. Almost there…almost there! We didn’t know it at the time, but the never-ending drive would be so worth it. 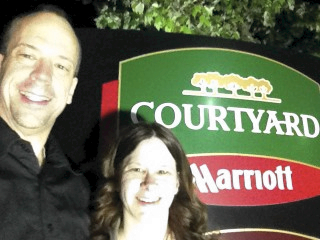 Having roused ourselves from a sound sleep at Franklin, Tennessee’s Courtyard Marriott at 3:00 AM on October 22nd, we quickly showered, dressed and hit the highway. My goal was to arrive on Amelia Island around 2:00 PM. I didn’t take into account the time change (Florida is, after all, in the Eastern time zone), nor did I figure on restroom breaks, unnecessary stops at the gates of Hell (otherwise known as Walmart) and my wife’s somewhat annoying insistence on eating meals so as to avoid those inconvenient fainting spells. So at the end of the day (and I mean literally the end of the day), we ended up arriving on Amelia Island at close to sunset. Apparently we arrived later than our inn keepers expected as the front desk exclaimed, “Oh! You made it!” when we announced our arrival. As some of you who follow me on Facebook may know, the journey to the island was challenging mostly because of my lack of patience and because I followed the advice of the RoadMate “app” by Magellan on my iPhone. RoadMate is their attempt at implementing a GPS routing application on the handy device. The great thing about GPS units (and GPS apps) is that if you know where you want to go but have absolutely no idea how to get there, these nifty devices are nearly foolproof. They will get you to your destination no matter what, and if you happen to take a wrong turn, they will work incessantly to get you back on track. The bad thing about GPS units is that they often times choose an asinine way of getting you to said destination. If you have any inkling of how to get to where you’re going by yourself–as I often do–you may find yourself arguing with an inanimate object–again, as I often do. After road tripping it to Amelia Island, I can honestly say that I do not recommend RoadMate. In its attempt to get us to the island as quickly as possible, we were taken along rural back roads, past prison after prison and–my personal favorite–an area of Atlanta where I was quite certain that given another time of day, we may well have been target practice for the local street gangs. The best part may have been driving past the United States Penitentiary in Atlanta, which ironically enough is located in an area that appears to be crime ridden. Go figure. At first, my wife commented on how cool a building it was. And indeed, it looked very antebellum. We were both convinced that maybe it was a former plantation or perhaps a government building of some kind. And, then…well…nope…we realized that it was in fact a really big jail–although I suppose it did qualify as a government building. I would have taken a picture, but as I looked around at the neighborhood I was in, I decided that it would actually be better to stay in our car, drive very quickly and perhaps even consider ducking. Continuing along, we were directed to more side streets, more rural southern back roads and secondary highways than I ever wanted to see in the south. In some places, the speed limit on the highway is still 55 and I’m reasonably convinced that I found them all. It finally occurred to me that in order to save us no more than five minutes, RoadMate directed us along hundreds of miles of back roads, city streets and dilapidated byways when in fact we could have stayed on highway 16 to Savannah and then onto highway 95 down to Fernandina and Amelia Island. Yes, technically the route along the major highways would have been somewhat out-of-the-way but at least they have rest stops along the highways instead of nearly abandoned gas stations staffed by toothless hill people and a guy named Bubba (no, really, that was his name: Bubba)! As a result of our trip, I have switched to TomTom’s GPS app. We will need to return to Amelia Island as soon as feasible and put TomTom to the test. Yo! Yo! Yo! Yo Wooten! In my rush and fervor to get to Amelia, I almost missed something grand: my own personal Route 66 experience. Now don’t post a bunch of comments telling me that Route 66 doesn’t run to Amelia Island. I am well aware of the fact that Route 66 actually runs from Washington, D.C. to Rhode Island. I’m kidding. Really. I don’t even know where Rhode Island is. Nor do I know why they can’t spell “road.” I’m kidding. Again. Really. I’m talking about enjoying the back roads of America. Our national highway system allows us to travel across the vast expanse of our country with relative ease, but it’s along the back roads and rural routes where you’ll find the soul of America. We found a part of that soul in the form of a lonely old lady from Savannah who called herself “Yo” Wooten and who just wanted to talk. We met her along one of those secondary highways that we were traveling on. She made sure to honk and wave after seeing the “just married” graffiti on our car as she passed us by. A few miles up ahead, unbeknownst to either of us, we both happened to pull off at a rest stop and as I was returning to our car, I saw my wife talking to her. She told us all about how her husband had died a few years earlier and how she missed him very much. She told us how she talked to him every day. She was driving from Atlanta to Savannah after visiting her children. She gave us all kinds of good advice on how to love each other and how to have a marriage that will stand the test of time. She told us that she was glad that she met us and was able to talk to us, because now she would think of us for a time, instead of missing her husband so much. I’m glad we were able to provide a distraction. I remember being impatient at the time. But now, I am glad to have met Yo Wooten. I hope she’s doing well. I hope maybe she thinks of us and smiles just a little. On October 22nd, I had the privilege of meeting a true southern belle. Maybe the back roads aren’t so bad after all. 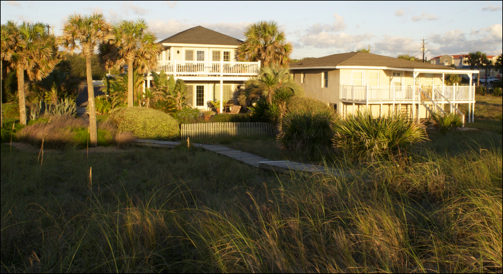 If I could choose to live anywhere in the world that I have visited, it would be Amelia Island. Who needs Hawaii? Who needs South Dakota? I’ve been to Amelia Island, and I’m here to tell you, it has everything. Okay, maybe not everything. It doesn’t have Destin’s emerald-green water or white sand, but it has a some important things that Destin doesn’t have and chief among those is a lack of tourists and beautiful undeveloped beaches where each day you can pick up seashells that regularly wash up to shore. Don’t misunderstand me, we loved Destin too. 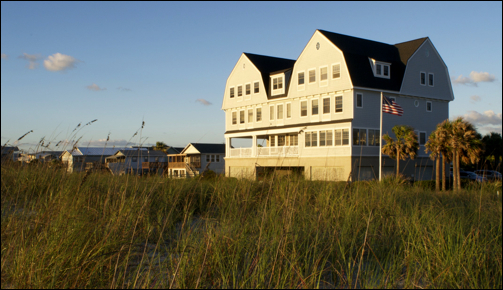 I actually enjoy the tourist activity–it gets you into that party feel–and a perfectly groomed beach is very nice to walk along, but for sheer escapism and romanticism with an ocean view, you cannot beat Amelia Island. For the first three nights of our honeymoon, we stayed at the overwhelmingly wonderful Elizabeth Pointe Lodge. I’m telling you, if you do nothing else before you die, please go and stay for a night or three at this amazing place. 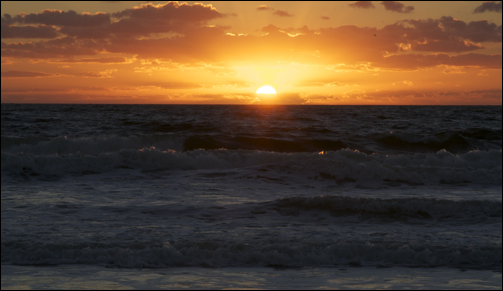 Sunrise on Amelia Island on October 23rd. We took this picture not more than 300 feet from the front door of our lodge room. Yep, I wouldn’t be doing much blogging on this trip. This is the main building at the Elizabeth Pointe Lodge, photographed at sunrise on October 23rd. This picture was taken just shortly after the sunrise shot above. I turned around, climbed a hill, positioned my tripod and fired away. It was impossible not to create something wonderful. The building on the left is the Ocean House and this is where my wife and I stayed. If you look carefully under the deck, on the main level just beyond the fence, you’ll see the door to the room we stayed in. The building on the right is the Miller Cottage. 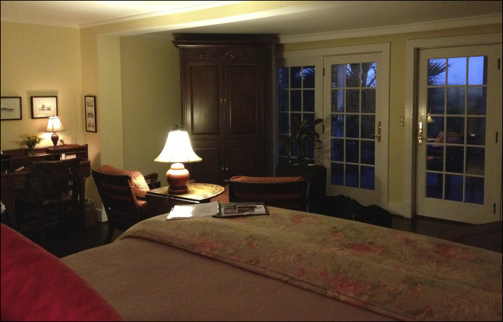 They told us there was a television in that armoire. I don’t know. We never looked. For a week straight, we never turned on a television. This is my favorite picture of her. It was absolutely unposed and unplanned; those are the best kind. Shortly after we arrived, my wife decided to explore the beach right outside our front door and I snapped a quick, unposed picture with my iPhone (the best camera is the one you have with you). This photograph captured a special moment in time. A moment when you know deep in your heart that you are precisely where you are supposed to be. After returning from our walk on the beach, we perused the hotel’s list of recommended restaurants and quickly came to the understanding that dinner wouldn’t come cheap. Breakfast was easier due in large part because it is included! 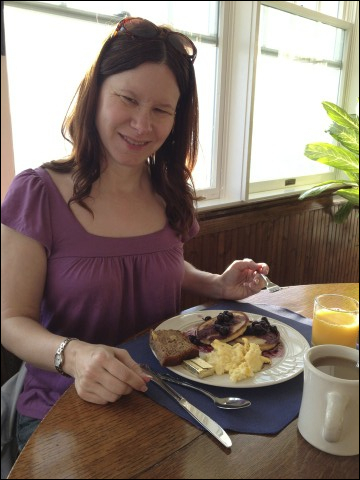 This isn’t any ordinary free breakfast at a typical hotel. From yummy pancakes to perfectly cooked eggs and everything in between along with a manager who personally sits down and chats with each and every guest. Yep, this isn’t the Howard Johnson’s! Lunch was equally costly, but my oh my, what a view! Oh! And the ocean is pretty too! Amelia: Cool Ocean Breezes, Romantic Nights and Trail Rides? 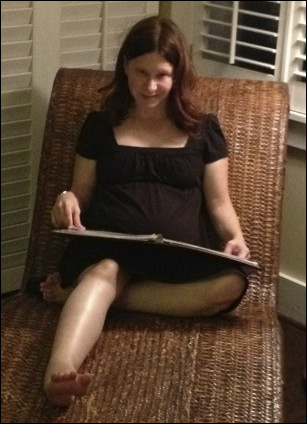 If you want to rest under an umbrella on the beach reading your favorite book, come to Amelia. 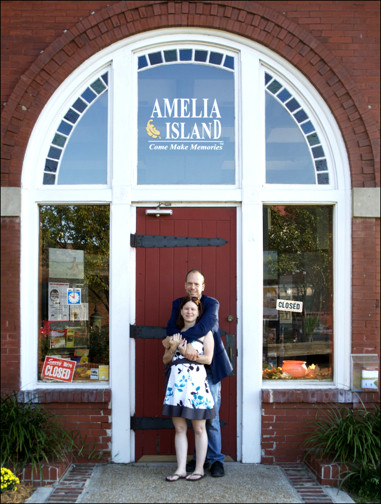 If you want to discover–or rediscover–romance, come to Amelia. If you want to experience real living history in paradise, come to Amelia. If you want to visit quaint shops selling everything from seashells to Christmas decorations, come to Amelia. If you want to watch seagulls flying, sandpipers running really, really fast along the shoreline and Pelicans dive bombing for dinner, come to Amelia. 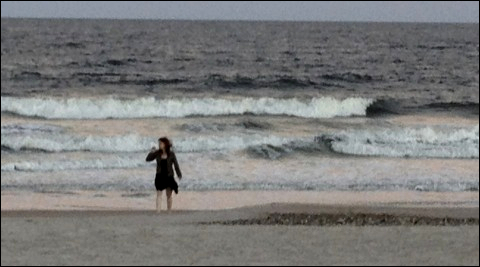 Perhaps my only regret from our honeymoon was not spending enough time on Amelia Island. There are more fun things to do, more amazing places to visit, more history to take in, more wonderful food to enjoy and more romance to be had than three days allows. But that just gives us the excuse to return time and time again. So maybe you’re the kind of person who wants to sit under an umbrella for hours on end while the ocean crashes to shore mere feet away. Maybe you have a love of history and are always sure to experience it every place you travel. Perhaps a walk on the beach by lantern light is your thing. 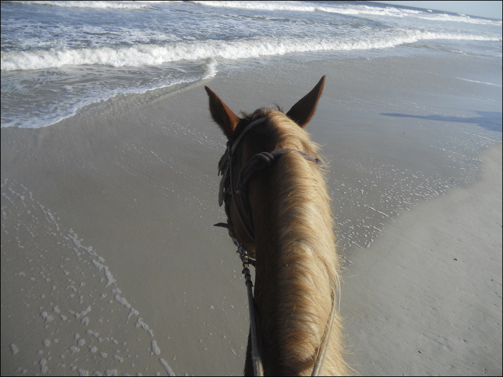 It turns out that Amelia Island is the only place in the United States where you can actually ride horses on a beach. Seriously. The only place. While I was not aware of that fact, it was just one piece of a plethora of information that was handed to us on our–apparently–one chance to ride horses on a beach. The fact that I was riding the horse from hell who refused to do a thing I asked of it and our terribly over-talkative guide made the trip less than ideal in my opinion, but the girl seemed to enjoy it, so all’s well that ends well, I suppose. After riding on the beach, I can understand why it isn’t allowed anywhere else. Horses aren’t shy about their “bathroom habits” and, gosh, on a beach, that’s just disturbing (actually it’s disturbing anywhere, but particularly so on a beach). Apparently there are only certain areas on Amelia Island where horses are allowed and people have been told to enjoy that section of the beach at their feet’s own risk. 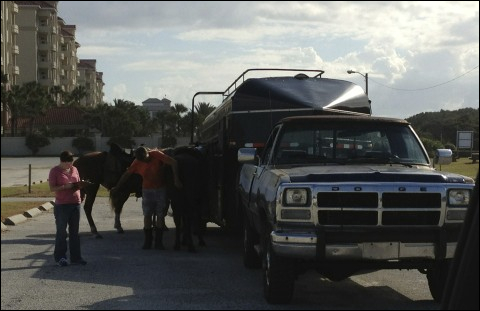 Unlike riding horses in the mountains of Colorado (or the molehills of Tennessee), when you ride on the beach, you meet your guide in a parking lot instead of on a ranch. 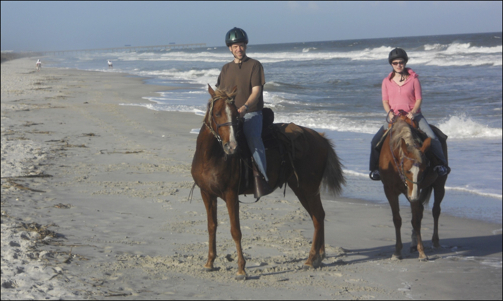 While riding horses on a beach seemed very romantic, frankly I was underwhelmed. Rather than riding through beautiful mountains with fall colored leaves, along canyon rims, in forests, beside waterfalls, up-and-down steep inclines and through gorgeous scenery, here you walk your horses to the beach (hoping they don’t step on you), mount up and ride straight down the beach for a half-hour and then literally turn around and ride for a half-hour back the same way that you came. And all the while–if you’re lucky like we were–you too will be guided by someone who doesn’t know when to stop talking. For example, I now know exactly where John Grisham lives, something I am sure that John Grisham appreciates. I’m going to call him and tell him that I know where he lives and see if he wants to hang out the next time we’re on the Island. And, he made us wear a stupid helmet. I’ve never had to wear a stupid helmet before. I look disturbingly like one of those special children you see attached to a leash. If you ever find yourself on Amelia Island, and want a unique experience that you can’t do any other place, you might want to consider going for a horseback ride on the beach, but be prepared to pay for it and make sure you ask around and find the best guide. A good or bad guide can make or break the experience. Do yourself a favor and don’t go for more than an hour. It gets monotonous and your rear end will thank you for a shorter ride. 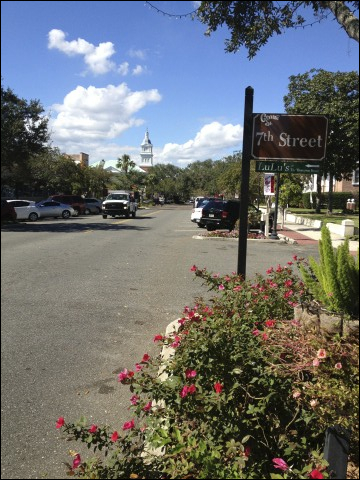 Amelia Island has a rich and diverse history. For history lovers, the Island is a treasure trove. No less than eight different flags have flown over Amelia in its turbulent history, including, of course, the flag of both the United States of America and of the Confederate States of America. While we didn’t have the time to explore Amelia’s history to the degree that I would have liked, we did tour Fort Clinch, an absolute gem of a Civil War relic. 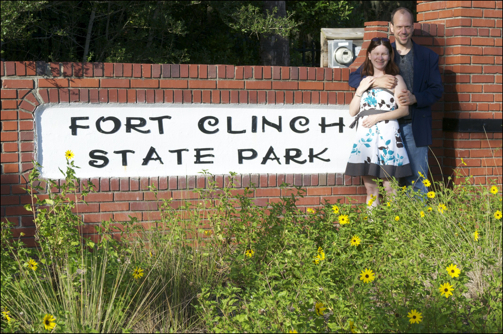 Fort Clinch State Park is a Florida State Park built around the now abandoned fort that was never actually finished and never saw any fighting during any of the wars that raged while it was in service. The fort’s construction began in 1847. In 1861, Confederate forces occupied it–without a fight–but as it was of little strategic value, it was abandoned and Federal forces eventually reoccupied it. It was completely abandoned in 1898. 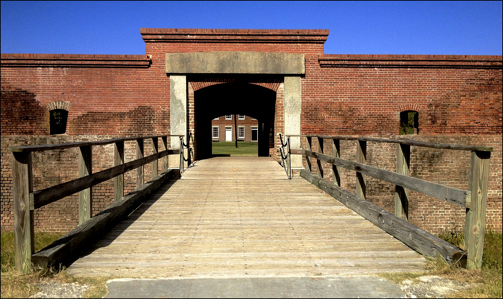 In 1938 after restoration work was completed, the fort was opened to the public as Fort Clinch State Park. Today, living history interpreters (complete with Civil War era Union Army uniforms) staff the park and guide visitors on an enjoyable, if a bit campy walk through its history. Standing just outside the gate into Fort Clinch State Park. We watched a short video on the history of Fort Clinch. Frankly, I found her more interesting than the video. Once you fight your way through the ever-present gift shop, you will visit a small museum full of typical Civil War history site fare: cannon balls, muskets and musket balls, uniforms, flags, dioramas and so on. After that, you are treated to a slightly cheesy and slightly too long video detailing the history of the fort. And then it’s down the walkway and off to the fort. 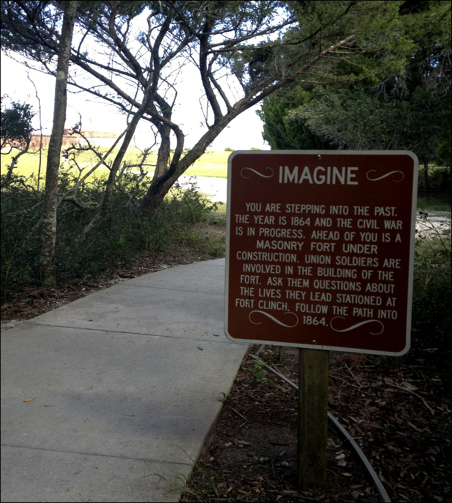 Fort Clinch is just ahead on this path and appears in the upper left in this photograph. Fort Clinch in the background with three of its heavy guns on display. The photograph above was taken on my wife’s iPhone (again, the best camera is the one you have with you). We used the panorama mode on the new iOS 6. Pretty cool. A normal photograph cannot capture the full expanse of the fort at this distance. It felt like we were crossing a drawbridge and entering an ancient castle. Here’s the outside wall just to the right of the large entryway in the previous photograph. That’s the Atlantic ocean in the background. 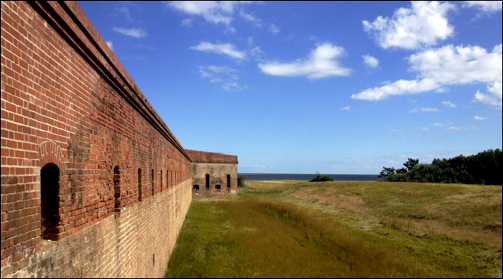 If you had to be garrisoned at an Army fort during the Civil War, it seems to me that you could do a whole lot worse than Fort Clinch. I’m told that the range of cannon no. 17 allows its payload to reach the island in the background. I wouldn’t want the business end of this monster pointing at me. 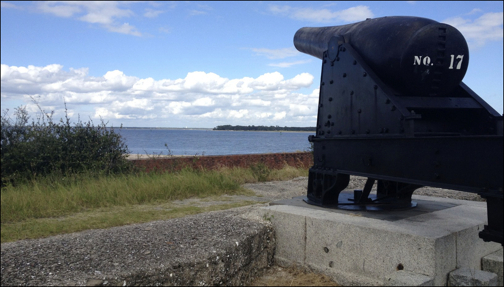 This view looks back at the cannon from the previous photograph and is taken at the top of one of the fort’s exterior walls. The building on the left housed officer’s quarters and the Quartermaster’s office among other things. These are two of my favorite shots. 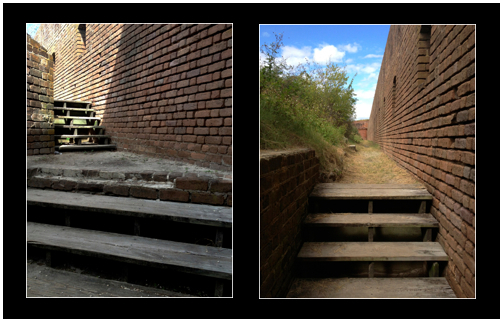 Fort Clinch is full of nooks and crannies, walk ways, long dark tunnels and very dark rooms. It’s mysterious and more than a little creepy. 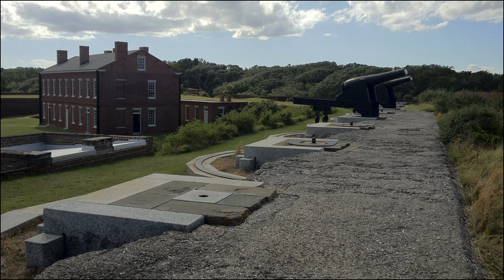 Fort Clinch is the best preserved example of an army outpost in the United States and is well worth a visit if you are in the area. Plan to spend a significant amount of time here as there is so much to see and do. Beyond the fort itself, there are nature trails to hike along, amazing vistas to enjoy and of course the public beach within the park itself. If you are a photographer, you cannot go wrong here. There’s an opportunity around every corner. After visiting Fort Clinch, we took a walk through the main tourist section of town to get lunch and do some window shopping. Our hotel was one block south of Atlantic Avenue on the Atlantic ocean. 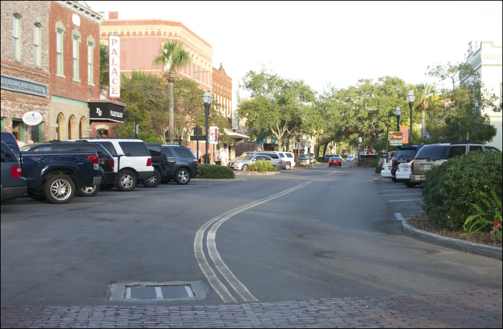 Atlantic Avenue–which becomes Centre Street as you head west–is the main drag that runs all the way from the Atlantic to the east and to Fernandina Beach Harbor to the west. This is where the tourist trap emporiums and most of the restaurants are located and after visiting the fort, it was a great way to spend a lazy afternoon. Here we are at Seventh and Atlantic Avenue. This view looks west toward the harbor. Headed west, Atlantic Avenue becomes Centre Street. 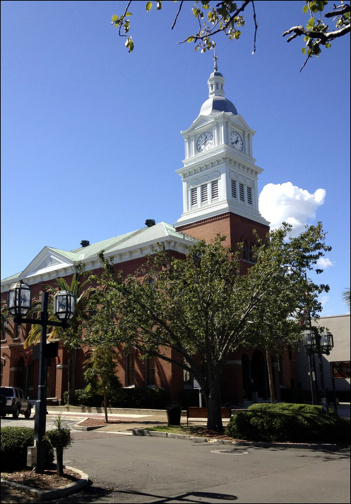 At Fifth and Centre Streets stands the historic Nassau County Courthouse. 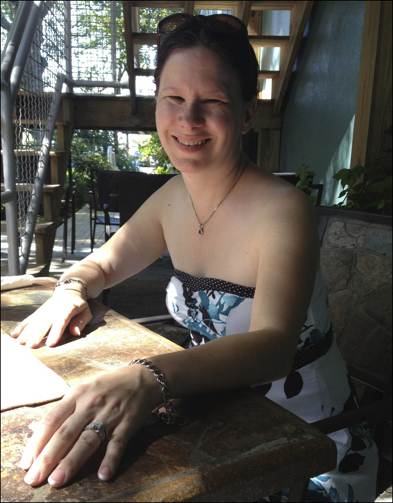 We stopped for lunch at a great little restaurant called Cafe Karibo where I asked my wife to show off her ring and her beautiful smile. Somebody did pretty well if I do say so myself. After lunch we picked up fudge and ice cream for dessert at a little shop called Fantastic Fudge. The name of their store is well deserved. Sometimes there’s nothing like little local places for the best food anywhere. We did our best to avoid eating at chain restaurants. Cute, isn’t she? Am I the luckiest dog around or what? What’s a great vacation without a tee-shirt that tells everyone where you went? 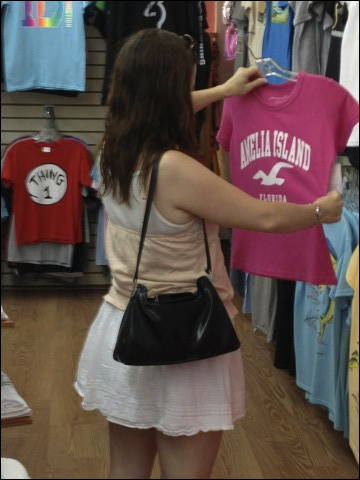 Yep, we got caught in the tourist trap at one of those places that sells shirts, more shirts and even more shirts. Oh yes, they sell bumper stickers too. And shirts. 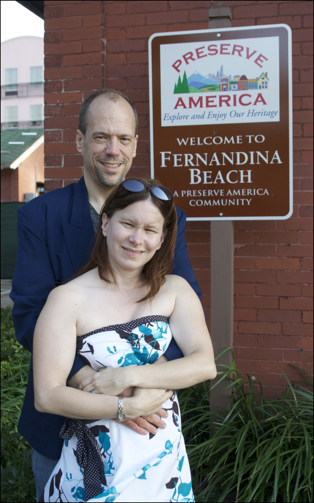 Here we are posing with one of those famous signs that everyone who goes to Amelia Island poses with. 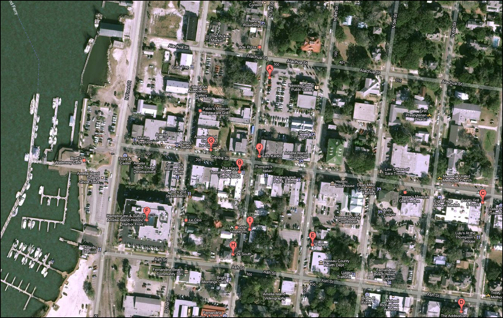 This is the tourist development center and is the place to go if you need any information whatsoever about Amelia Island. This view looks back toward the east as if headed back toward the Atlantic ocean. That’s the famous Palace Saloon on the left. 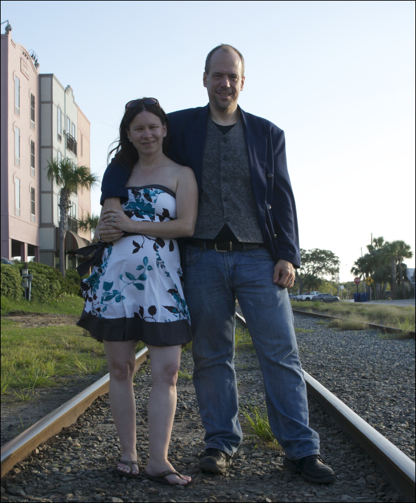 This picture was taken just across the street from the Fernandina Beach Harbor and is my new favorite photograph of my wife and me. The best pictures are those that are unrehearsed and unposed; those that capture true feeling and don’t have that set up feeling. I just set the tripod and the camera, hit the self-timer and threw my arm around her. This was the result. Magic. 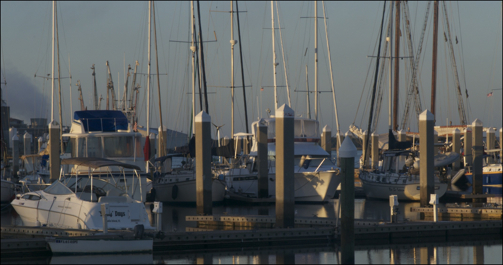 This is the Fernandina Beach Harbor Marina with its hundreds of boats docked away until their next voyage. Everything from tiny dinghies to massive yachts were docked here. Here’s a Google Maps view of Centre Street and the harbor. It’s fun to be able to look back and see exactly where we were and the places that we took photographs. We had a great time window shopping in many of the eclectic shops on Centre Street. We bought a Christmas ornament to remember our time here at a cute little store called Christmas on the River. We visited a store that sold sea shells that were imported from China (go figure). Even our dog Buckley got a souvenir: a brand new “Life is Good” water dish, just because he helps make sure that life really is good. After a long day of touring Civil War forts, shopping and eating food that was really bad for us, we took one last chance to relax on our deck. This is the private wrap around deck attached the room that we stayed in (Breezes) at Elizabeth Pointe Lodge’s Ocean House. For three amazing days, this was our deck and we were surrounded by tropical plants and palm trees. I explained to my wife that my goal was to take us someplace that we would remember twenty years from now; a place that we would return to again and again. There is no doubt for either of us that we accomplished just that. “Come Make Memories” says the sign above our heads. And we did. We made beautiful, funny, wonderful, amazing, crazy lifetime memories. These are the kind of memories that you never forget; the kind you tell your children about. For three wonderful days we made memories here on Amelia Island that will forever be a part of our history. And then, it was on to Destin. Would you like to see all that we saw in ten minutes? Watch this short video! If you watch closely, you’ll even see the Elizabeth Pointe Lodge at five minutes and thirteen seconds. 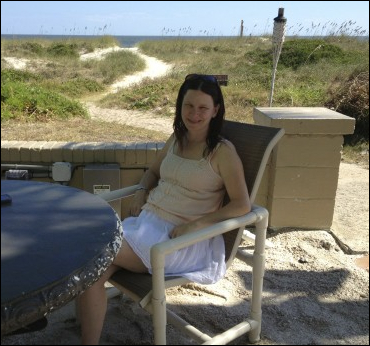 This entry was posted in Travel and tagged Amelia Island, Bikini, Destin, Elizabeth Pointe Lodge, Emerald Green Water, Florida, Hilton Sandestin, honeymoon trip, nature, outdoors, White Sand by Kirk Peterson. Bookmark the permalink. Kirk, I didn’t miss the comment about the tee-shirt! 🙂 What a beautiful way for you to memorialize your memories for the two of you and whoever may be lucky enough to share them with you for years to come. This was beautiful and I look forward to Destin. Enjoy. Honey, I always enjoy your posts – especially when they are about us. 🙂 Love you!! !